A 3D platforming game set in the style of a Nintendo 64 title. 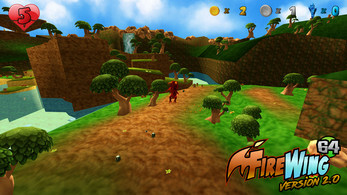 You control Firewing, a dragon tasked with collecting all of the Peace Crystal fragments. 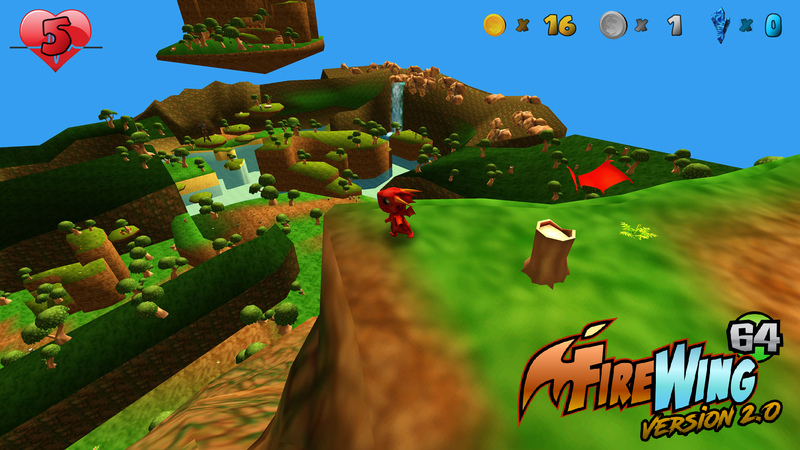 To do so will require exploration, collectibles, mini-games, and of course, platforming! This game was originally started as a side project of mine as I wanted to try recreating a Nintendo 64-style title. It was then left alone for a number of months until one day I decided to adjust the scope of it (or else it likely never would have been finished) to fit in to a single level. This gave me the motivation to finish it (albeit it with basic menus and a very simplistic story) but still deliver that Nintendo 64 feel! Loads of items to collect! Large, expansive level with a variety of gameplay! Mini-games, which includes kart racing! 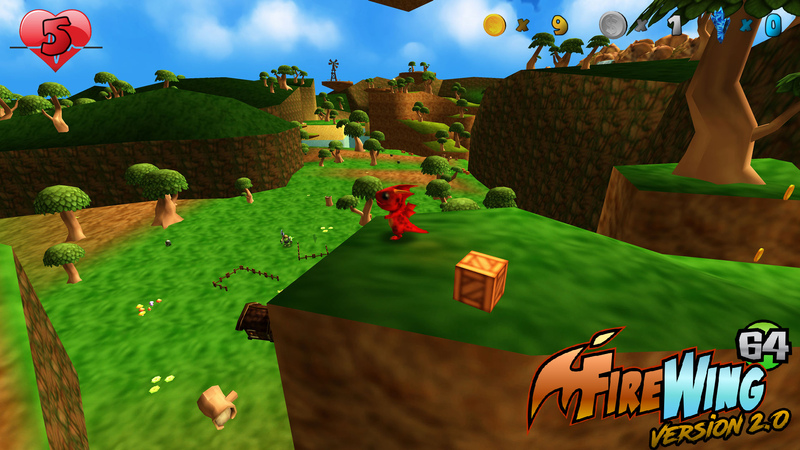 An offering of nostalgia 32/64-bit platforming fans long for! this game has a lot of potential. i could feel a bit of the magic that i did playing SM64. however, the platforming on this was so frustrating because of the lack of smooth jumping and character momentum that i had to stop playing after the first wall jump. also, the character kept running into walls because the camera had no adjustment throughout the game. i find a really important feature in 3d platforming such as legend of zelda and sm64 is a camera that adjusts for you. i think that something that would help this game is some more original assets to drive home the older 64 whimsy, but i understand with this game being free that assets are not always going to be the best. i would love to see how this game evolves in the future, and hopefully i'll get to play it again myself! Thanks for the feedback, and I agree on the character momentum. I recently revisited it and didn't like it now either, so I began working on a better one. 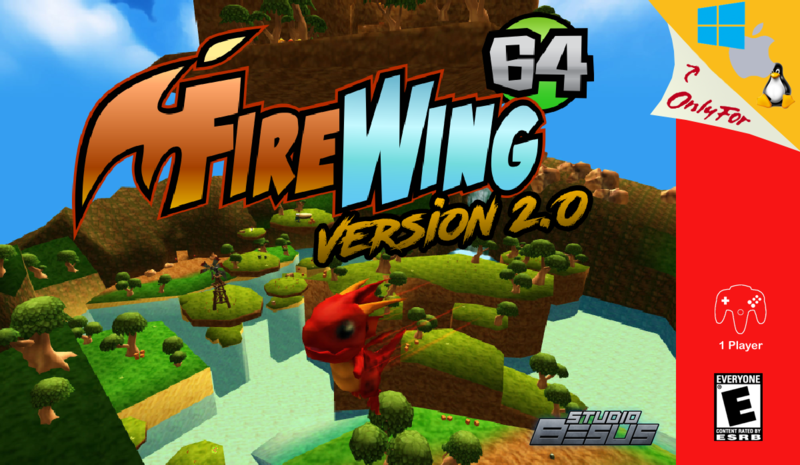 Should Super Firewing 64 ever wrap-up, I think you'll like it a lot more. Is there any way I can completely 100% make this game forget I've played it? I wanted to play it on my channel, but while testing the game to make sure I could record it well, I started it and now I can't get the intro cutscene to play again. Sure can - just delete the save file. They are located in: \AppData\LocalLow\Studio Besus. Removing the whole Firewing folder should take care of it. I had another look, and apparently the itch client had created a new "user?" in the Users folder. I needed to give permission to access the folder, so maybe that's why performing several system wide searches for terms such as "Besus" and "FireWing" and "FW64" didn't give any results. Great, I will try right now!! This is great! 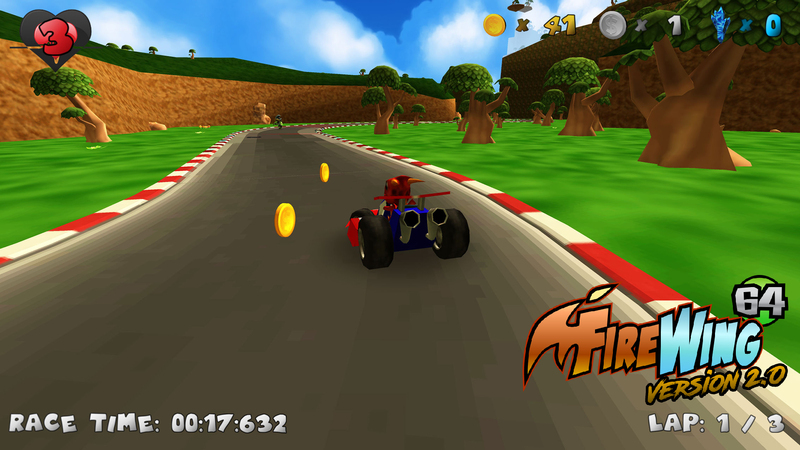 You definately met your goal of making a successful N64 kind of game. 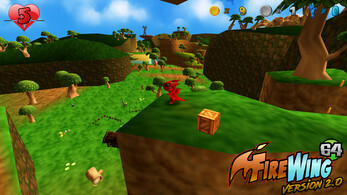 Just enough familiar style to the best 3D platforming titles on the system for the retro feel, but definately it's own game. I could see FireWing being a successful mascot gaming franchise. 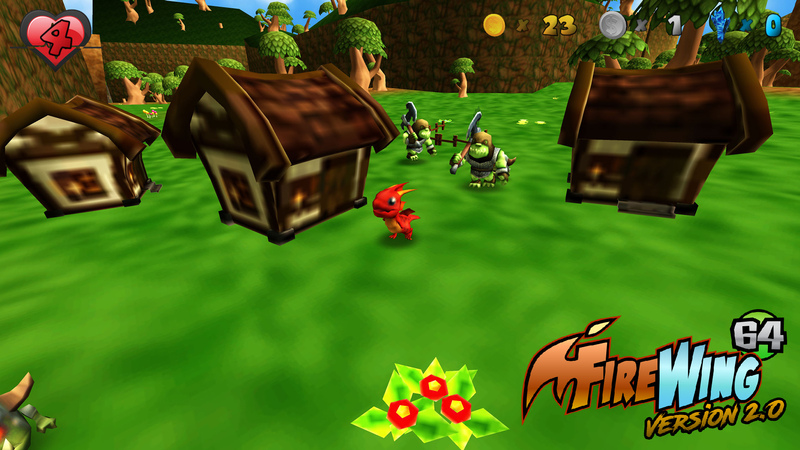 It will draw similarities with the likes of Spyro and Mario 64, but it is for sure it's own game. I'm guessing that is what you were kind of going for. I think people would pay at least $10 for it if you would finish it and publish it. Thanks for the kind words, and glad that you enjoyed it! Thanks for the compliments and suggestions! You know what this game needs? Rainbow gradients. 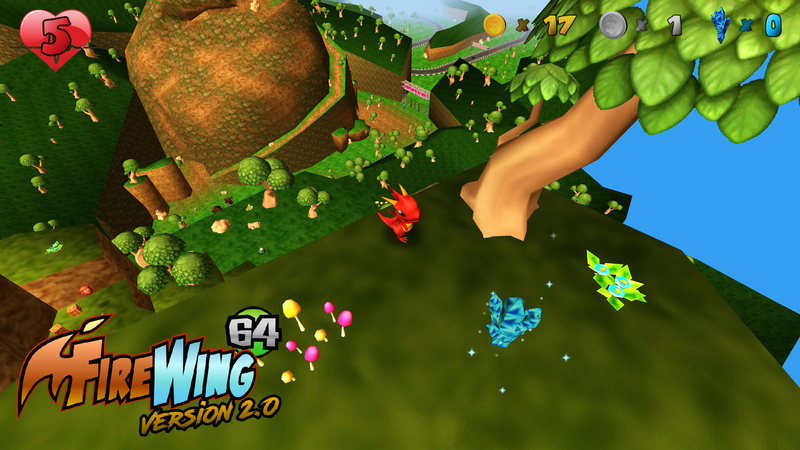 The Rareware games had colorful gradients overlaid over everything. Joking aside, this plays quite well. I like using my N64 controller for it. This looks like a cool little game, unfortunately does not seem to support GL 2.1. This game probably does not take all that much of a graphics card to run, but still a bit much for software rasterizer. Hello! I played Firewing 2.0 and had a blast. I'll definitely be following development from here on out. I know you haven't explicitly asked for criticism and I don't mean to be rude, but maybe my comments will be useful for you. Good luck with the game! I don't mind at all! In fact, thank you for taking the time to do that! That's exactly the kind of constructive feedback I look for! No probs, dude. When I see a promising game like this, all I want is to see it realized as a full and great game. If I think I can help, I just can't stop myself. Also as a fellow dev, I know how useful criticism can be. It's refreshing to see someone so receptive of it! 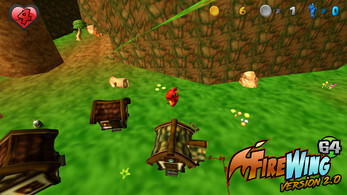 ChasingErin's Firewing 64 Playthrough! 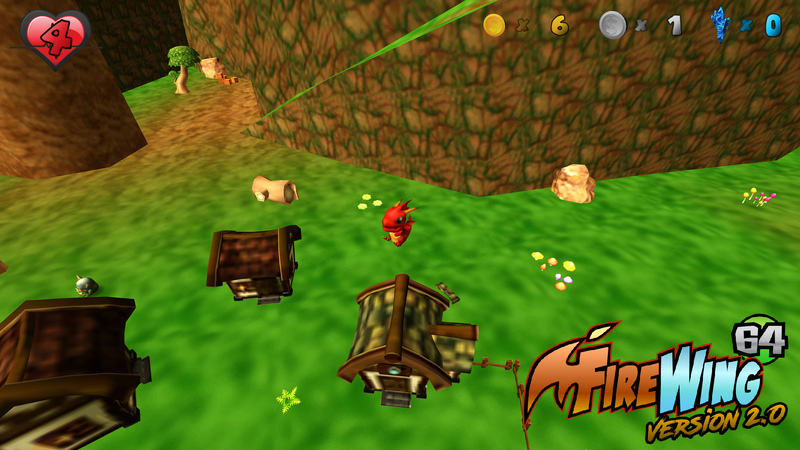 Definitely one of the best N64 styled fan games I've come across yet! A good idea would be to have the ground-pound move have more use than just 2 switches though. Regardless, you created an incredible game! Would love to see similar content in your future projects! Keep up the awesome work! Thanks for the kind words. The pound is used more; it's the only way to destroy the houses. You may definitely want to give v2.0 a shot though! Pretty neat game. But I couldn't fix the kart. It was hard enough to find the switch to open the kart area, but then when I go get on the kart I have to fix it (I assume it's by finding something and I already looked everywhere) and after a little bit more exploring and not finding anything, I just stopped playing. But I like it otherwise. The point is to explore; I'm not going to hold the players hand through everything in the game. Added saving and persistence (among a large number of other things) in v2! There is no Mac version, I don't know why seeing as it is clearly advertised on the cover, but I'd guess that they're working on it. Hey, I seem to have a collision bug that kills the frame rate whenever I try to move on the ground.